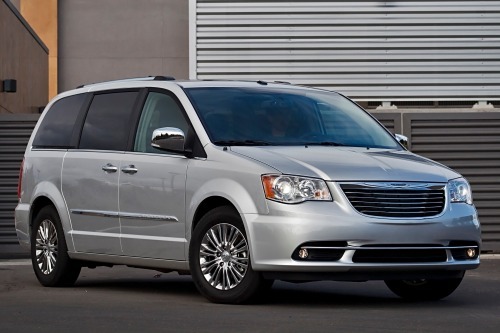 Chrysler’s latest recall impacts about 282,000 model year 2013 minivans worldwide. According to the automaker, certain vehicles contain faulty sensors that are incorrectly detecting the impact of a crash. As a result, the side-airbags are deploying on the opposite side of the impact point. The recall covers the 2013 Dodge Grand Caravan, Chrysler Town and Country and Ram Cargo Van. The recall covers 224,000 vehicles in the United States; 49,300 in Canada; 2,900 in Mexico and 5,300 outside of North America. The software glitch has been linked to three crashes and one minor injury. Chrysler discovered the problem during an internal investigation, which was launched after it received a customer complaint. Front-row airbags and passenger-side dashboard airbags are not affected by the recall. Chrysler has not announced a notification schedule, but did state that it would reprogram the component at no cost to the owner. In the meantime, owners may contact Chrysler at 1-800-853-1403. Drivers may also contact the National Highway Traffic Safety Administration’s Vehicle Safety Hotline at 1-888-327-4236 or visit www.safercar.gov. The Auburn Hills automaker announced the sizable airbag-related recall yesterday along with four other recalls – including one covering 490,000 cars and SUVs. Chrysler issued the massive recall to address a microcontroller issue, which affects the vehicle’s active head restraints. The recall impacts model year 2011-2013 Chrysler 200, Sebring and Dodge Avenger cars; Jeep Liberty SUVs; and 2011-2012 Dodge Nitro SUVs. Roughly 442,000 of the recalled vehicles were sold in the United States. Click here for more information about Chrysler’s recall of 442,000 Chrysler, Dodge and Jeep vehicles. The carmaker has now issued an astounding 12 recalls since facing off with the National Highway Traffic Safety Administration last month over whether to recall 2.7 million older model Jeeps. Despite a bitter two-week battle, Chrysler eventually agreed to recall 2.7 million model year 1993-2004 Jeep Grand Cherokee and 2002-2007 Jeep Liberty SUVs. The recall stems from a three-year-long government probe, which found that the gas tank location on older model Jeeps made the vehicles susceptible to fires in the event of a rear-collision crash. There were 51 death related to the issue, according to the NHTSA. The carmaker has recalled 3.3 million in less than one month. By comparison, Chrysler issued 13 recalls covering 1.3 million vehicles in all of 2012. Stay tuned for more information regarding Chrysler airbag software recall, including an updated recall notification schedule.